I don’t know about you, but I cannot work out unless I have some good tunes pumping in my ears. The more upbeat, the better, in my opinion. The only problem is that since I go to the gym so frequently, I end up listening to the same songs over and over (and over!) again, which can be kind of boring. But whenever I load new upbeat workout songs onto my iPhone, I actually look forward to going to the gym and I find my workouts fly by much faster. Motivating workout songs can really make all the difference! I try to update my gym playlist every 2 weeks or so, which means I have collected A LOT of fabulous upbeat workout songs over the years, and since I know I’m not the only one trying to step up my workout routine in an effort to lose weight and get toned in time for bikini season, I decided to share this list of 40 good songs to workout to. Apparently I’m on a total Robyn Schulz kick too, because I have “Prayer in C” and “Waves” (both by him) at #7 & #10. The lyrics in “Prayer in C” might not immediately make you think of working out, but the tempo of his beat on that song is perfect for so many of my weight lifting routines! “Waves” has that slow-build thing going on, and it alternates between slower moments and more upbeat moments. This is one of those songs you can use for intervals, weight lifting reps or even your warm-up and cool-down. And “Rather Be” at #21 is my definition of an upbeat workout song! It’s full of inspiring lyrics with positive vibes, and a beat that practically forces you to get moving! If you click on the affiliate links below (or the ‘view’ button in the album above), they will take you straight to iTunes where you can preview and listen to the songs to decide which ones you like the most. I’m really digging 5, 7, 10, and 21 right now, but all of these workout songs will keep you pumped and (hopefully) give you the motivation you need to get back in shape (and stay in shape)! 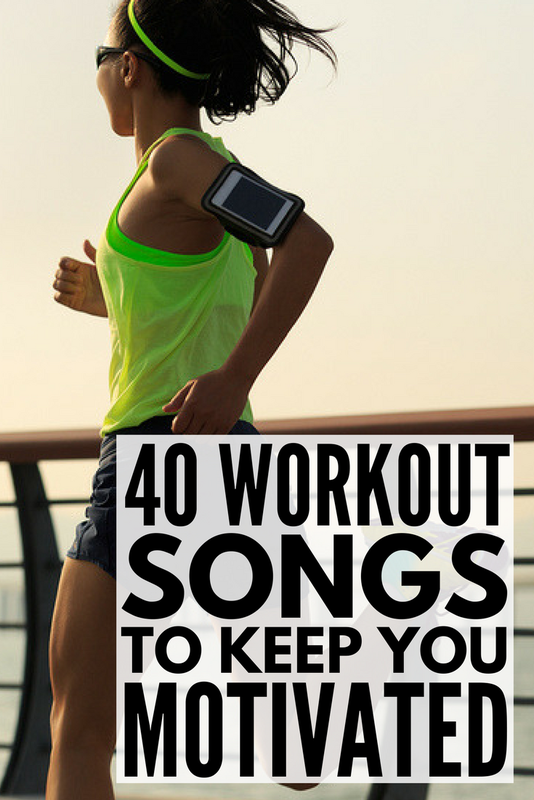 I know you’ll find some great upbeat workout songs that YOU love on this list! Of course, you may want to find your songs to fit your music preferences (but this playlist will give you a place to start looking for motivating workout songs). So if you’re searching for your own workout songs, you can zero in by searching for music that has a tempo to match your fitness level. You want to make sure the motivating workout songs you choose fit your pace! Beginners should pick songs with a mellow beat or you might end up burning out quickly. And if you’re really comfortable with your routine, you might want to choose really upbeat workout songs that push your limits and help you get the most out of your training! For cardio, a faster beat will get you moving and help you burn calories. On the treadmill, elliptical or other cardio machines, you can easily change up your pace, incline or resistance to match the song’s tempo. Interval training has many benefits, so use that workout playlist to your advantage! On the other hand, if a song with a slower tempo comes on during a weightlifting routine, slow those reps down! Many trainers will tell you that it’s important to vary the pace of your reps, so let the music help you out! Getting to the gym and making that workout happen is not always easy – and sometimes it’s nearly impossible! But a solid playlist full of inspiring beats is one way to make working out a lot more enjoyable. If these workouts songs gave you the motivation you needed to sweat it out at the gym, please share it on Pinterest! Fitness board where we share all kinds of ideas!